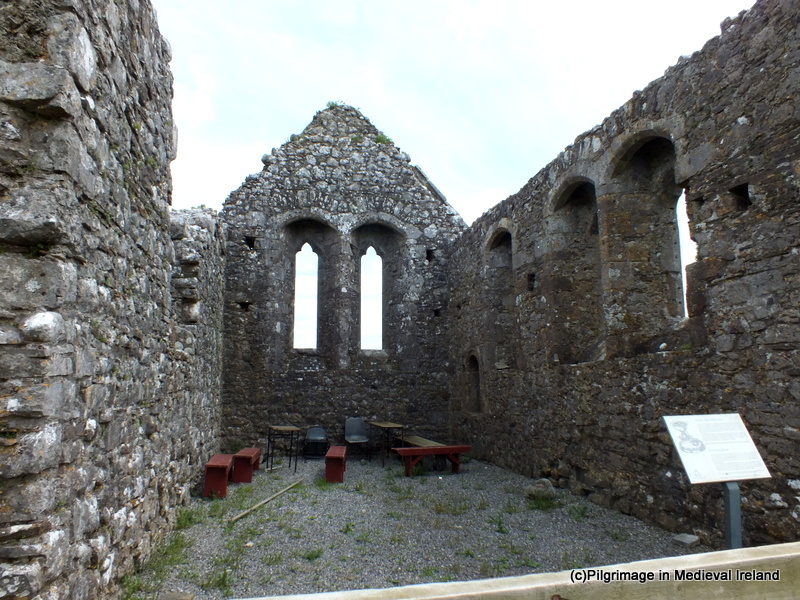 Last year I was delighted to write a guest blog post about of the pilgrim site of Kilgeever in Co Mayo. 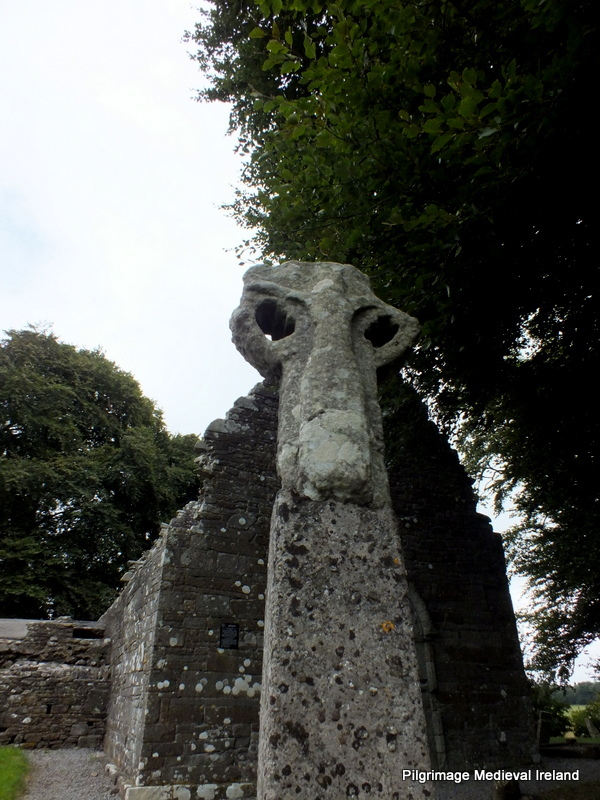 This post was a guest blog for the very informative heritage blog The Standing Stone.ie. This is a great blog and worth checking out as it has lots of varied and interesting content. 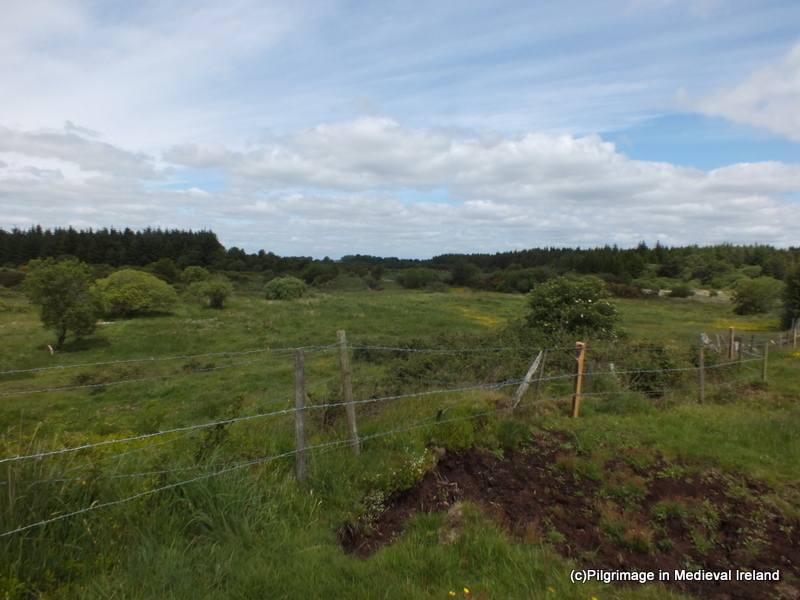 At the moment I am working on some research concerning this area of Mayo and as the site is fresh in my mind I have decided to repost my guest post. Kilgeever/Cill Ghaobhair is located in the most scenic of setting on the slopes of Kinknock around 3km outside of Louisburg in Co Mayo. The site is part of the Clew Bay Archaeological Trail. View of the medieval church at Kilgeever from the small laneway that leads to the site. Local folklore holds that St Patrick came to Kilgeever having completed his fast of forty days and nights on the summit of Croagh Patrick. It is said that Patrick decided to build a church here and that he later sent St Iomhair one of his disciples completed the task. Some traditions would suggest that “Kilgeever” is the anglicised version of “Cill Iomhair” or the church of Iomhair. The Ordnance Survey Letters of 1838 translates the name as St. Geever’s Church. Curiously neither variants of the saint’s name are found in Ó’Riain’s Dictionary of Irish Saints. 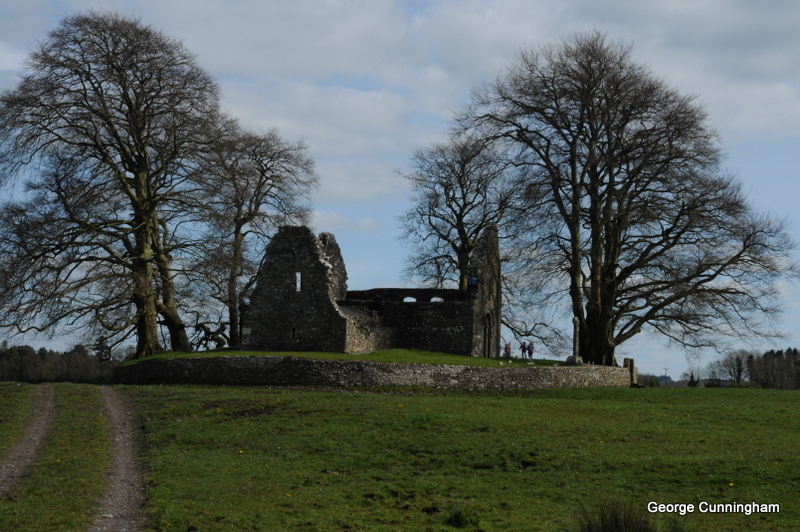 Kilgeever- according to the interpretation of most people means “the windy church”. View of Kilgeever Church and graveyard. Almost nothing is known about the history of the site but it appears to have functioned as a parish church in the late medieval period. Today the site consists of the ruins of a multi-period medieval church surrounded by a historic graveyard, a holy well and penitential stations. At least three early medieval cross slabs are associated with the site suggesting some sort of early medieval activity. If there was an early medieval monastic settlement here as the name ‘abbey’ would imply no physical remains survive above ground. Traditionally pilgrims visited here on the 15th of July the Feast of the Apostles and on Sundays. The Ordnance Survey Letters of 1838 refer to a pattern formerly held on the 15th of July. There was also a tradition of visiting the site on the last Sunday of July. For some pilgrims it is a key component of their pilgrimage to Croagh Patrick and having completed their pilgrimage on the summit of Croagh Patrick they descend the mountain and end their pilgrimage at Kilgeever. The ITA Files 1944 also makes reference to pilgrims visiting here from the 15th of August to the 8th of September with the annual pilgrimage day being the 15th of August. 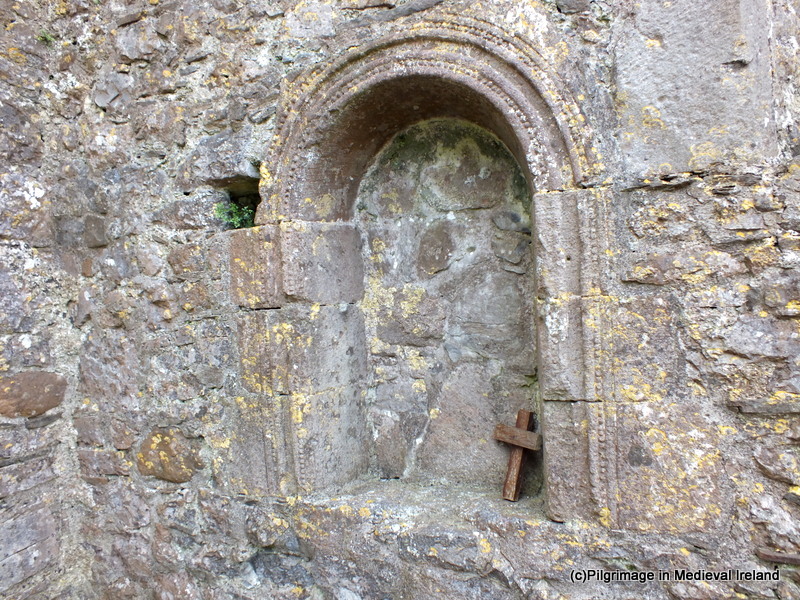 The main focus of devotion at Kilgeever is a small holy well located in the northwest corner of the historic graveyard that surrounds the medieval church. It is a good spring and much frequented by pilgrims especially for Sundays and on the 15th of July when a pattern is held, now at Louis Borough but which was formally held at the this well. The traditional pilgrim stations begin at this holy well, located just inside the entrance to the historic graveyard. The well is known locally as “Tobar Rí an Dhomhnaigh” or “Our Lord’s Well of the Sabbath” and the 1st ed. (1839) Ordnance Survey Map record the name of the well as Toberreendoney (Anglicisation of the former). The pilgrimage begins with the pilgrim walking clockwise around the well forming his/her intentions. The pilgrim then kneels at the well and recites 7 Our Fathers (Paters) & 7 Hail Mary’s (Aves) and the Creed. The pilgrim stands and circles the well 7 times while reciting 7 Our Fathers, 7 Hail Marys and the Creed. Once the perambulation is completed, the pilgrim kneels again at the well and recites 7 Our Fathers, 7 Hail Marys and the Creed. It was not uncommon for pilgrims to pick up 7 stones from the well as an aid to counting the rounds dropping one stone as each circuit of the well was completed. The use of stones to count prayers is a common practice at Irish many Irish pilgrim sites especially those with complex prayer rituals. The pilgrim then walks to the three flagstones located to the south of the well where he/she recites 5 Our Fathers, 5 Hail Marys and the creed while kneeling. The pilgrim then proceeds to a small rock outcrop known as St Patrick’s rock where he/she kneels and rites 3 Our Fathers, 3 Hail Marys and the Creed. This stone is reputed to bear the tracks of St Patrick’s Knees (ITA Files). In modern times some pilgrims have inscribed crosses on this rocks and others around where the stations are performed. The pilgrim then walks to and enters the medieval church at the centre of the graveyard. Kilgeever church is a multi-period church with a fifteenth doorway. Within the interior of the church the pilgrim kneels and again recites 7 Our Fathers, 7 Hail Marys and the creed and pray for the souls of the dead. In the 1940s it was common for pilgrims to leaving the church following along the west wall (ITA Files). Pilgrim cross carved by modern pilgrims on 19th century graveslab within Kilgeever Church. Some pilgrims continue a modern practice of scratching a cross into a late 19th century graveslab belonging to the Mac Evilly family. When I visited the site in 2014, a number of tiny stones were left on the edge of the slab. Other accounts suggest that in the mid-twentieth century pilgrims were in the habit of leaving votive offering in the aumbry within the church. This tradition was not noticed on my visit but a number of religious objects were left at the well. Having left the church the pilgrim walks back to the well via a stream that runs the length of the western side of the graveyard. If the pilgrim’s stations are being performed on behalf of a living person the pilgrim is to walk in the waters of the stream to the well. If the pilgrimage is being performed for the dead, the pilgrim walks along the edge of the stream. Stream running along the western side of the site. The pilgrimage is completed when the pilgrim circles the well a further 3 times prayer in honour of the Blessed Trinity. Before leaving the Holy Well pilgrims are invited to pray for Henry Murphy of Castlebar who had the cross erected over the well (as indicated by an inscription on the cross). A photo dating to the 1890s and part to the Wynne Collection at Mayo County Library shows pilgrims kneeling in prayer at the holy well in bare feet. This photo confirms what was a common practice at the time for people to complete such pilgrimages barefoot and even today at a small number of pilgrim sites pilgrims continue this practice. The photo also shows that the well has changed little over the years with the exception of the addition of the cross which now surmounts it. Early Medieval Cross Slab with an outline Greek cross found at Kilgeever. This is one of three cross slabs from the site. Kilgeever is one of the most peaceful and tranquil places to visit and it is just one of many interesting sites around Clew Bay area. View of the east gable of Kilgeever church. Corlett, C. 2001. Antiquities of west Mayo: The Archaeology of the Baronies of Burrishoole and Murrish. Bray: Wordwell. Higgins & Gibbons 1993: J.G. Higgins & Michael Gibbons. ‘Early Christian monuments at Kilgeever, Co Mayo’. Cathair na Mart, 13, 32–44. Irish Tourist Association Files for Mayo 1944. I was hoping to have this post ready for the feast day of St Laserian on the 18th of April but better late then never. St Laserian has strong associations with Co Carlow and I have discussed the modern pilgrimage to St Laserian at Old Leighlin Co Carlow in previous posts. The saint is also associated with a place called Lorum in Co Carlow. According to folklore when St Laserian returned to Ireland from Rome he set out in search of a location to build a monastery. When he came Lorum (a few miles south-east of Muinebheag (Bagenalstown)) he stopped on top of a large hill . The saint was so impressed by the area that he decided to build a monastery here. God however had other plans for him, and while he knelt in prayer an angel proclaimed ‘ Go where you shall see the first shinning, and there shall your religious house be established’ ( O’Toole 1933, 17). Taking heed of the angel the saint set off again on his search which ended when he arrived Old Leighlin which became the site of his monastery. Lorum (Leamdhroim in Irish) appears to have been the site of a religious foundation. Gwynn and Hadcock (1970, 397) recorded that Lorum was an early medieval monastery dedicated to St. Laserian . Brindley notes in 1204 the Bishop of Leighlin was confirmed of his possession of lands including ‘Lenidruim’ (Lorum) (Cal. papal letters, 18). 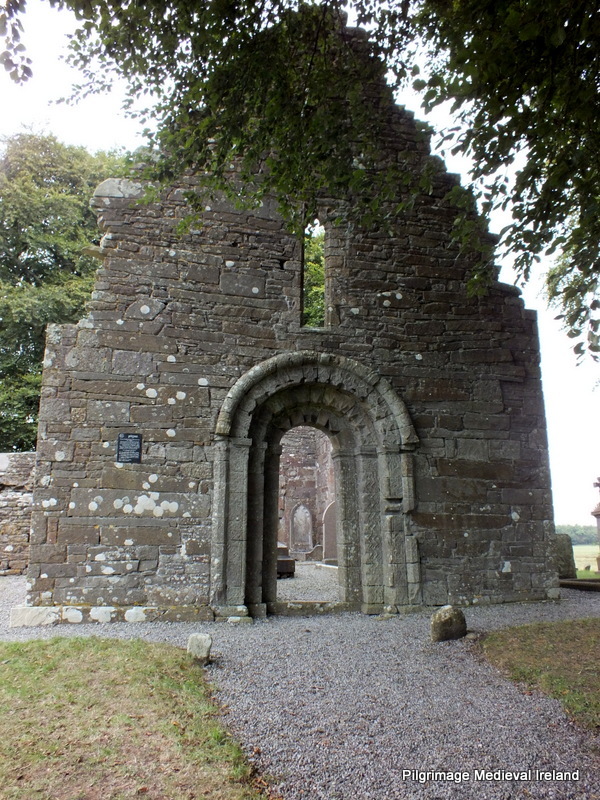 The church at Lorum was valued at 3 marks in the 1302-06 ecclesiastical taxation of Ireland (Cal. doc. Ire., 250) and by the late 16th century it was in ruins. The Ordnance Survey Letters for Carlow recorded Steward, writing in 1795, noted that the 18th of April, the feast of Laserian was celebrated at Lorum and until the 1830s a pattern day was held here. All trace of this monastery and medieval church have long disappeared. Today Lorum consists a stunning Church of Ireland Church built circa 1830 with a historic graveyard on its western side . The curve in the road on the east side of this church may tentatively reflex the line of an earlier medieval enclosure. Within the historic graveyard are the ruins of a post medieval church. The structure is in poor condition and with the exception of the west gable only the foot prints of the other walls survive. The upstanding gable appears to incorporated stones from an earlier church. Ruins of post medieval church at Lorum. The remains of an 18th century porch with red brick in the fabric is attached to the exterior of west gable of the church. Lorum, there was, it is said, an old Church before the present Parish one, which is now falling to ruin, was erected. The spot where it stood is shown in a field, a few perches to the northeast corner of the Parish Church and a few yards to southwest corner of a Church (C of I church) which is now in progress of being built (O’Flanagan 1934, 311). The ITA Survey of 1945 identifys the ruined church as the remains of an 18th century Church of Ireland Church and the medieval church as being located as a low-rise of ground inside the graveyard. Both churches were replaced by a seven-bay Gothic Revival Church with buttresses and parapet built c. 1838 and designed by Frederick Darley. Close to the church are the ruins of a small post medieval house which shows signs of rebuilding and alterations. A plain granite base of a high cross provides the only physical evidence of early medieval activity at the site. The remains of a second early medieval cross are found 200m to the west of Lorum graveyard. The cross is located on the north side of east-west running bohereen. The monument consists of a medieval cross shaft set in a cross base sitting on top of a cairn of stones and earth. Lorum is associated with two holy wells. According to ITA Survey (1945), a well dedicated to St Laserian was located to the north the old graveyard. The well was not recorded on the 1st ed OS 6-inch map for the area but the files state it was covered by well house and located northnorthwest of the church. The farmer who owns the land the well was located on told me there was no longer a well here and he had not heard of a holy well in this location before. A holy well dedicated to St Molaise ( the Irish for Laserian) is located to the east of the old church. The 1st ed OS 6-inch marked the well as St Molappoge’s well. The well which is now dry is stone-lined and rectangular in shape. It is covered by a large lintel stone. The well is in reasonable condition but is no longer visited by pilgrims. St Laserian is no longer venerated in the area and all focus of the saint has moved to Old Leighlin. This is a lovely place to visit and you can see why St Laserian wanted to settle here. Brindley, A. 1993. Archaeological Inventory of County Carlow. Dublin: Stationery Office. O’Flanagan, Rev. M. (Compiler) 1934 Letters containing information relative to the antiquities of the County of Carlow collected during the progress of the Ordnance Survey in 1839. Bray. 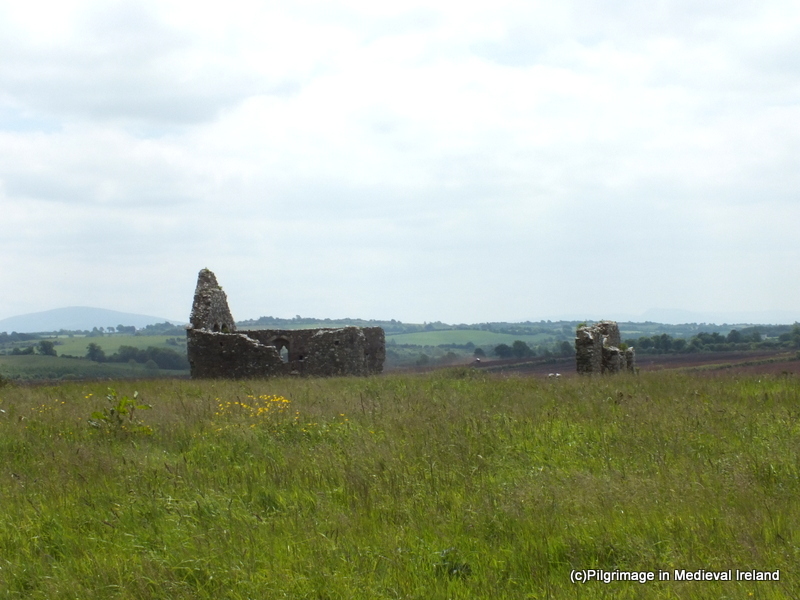 Monaincha in North Co Tipperary was one of medieval Ireland’s most important pilgrim destinations. It’s a site I have visited many times and have a great fondness for. Located a few miles from the historic town of Roscrea it is a wonderful place to visit. I am delighted to present a guest blog post by historian and organiser of the wonderful Roscrea Conference George Cunningham about the history of Monaincha. George has carried out much research on the site over the years. This post provides an over view of the pilgrimage history of what was at one time one of Ireland’s most important pilgrim destinations. A History of Pilgrimage to Monaincha, the Holy Island of Loch Cré by George Cunningham Monaincha also know as the 31st Wonder of the World, the Island of the Living, was once Munster’s most famous place of pilgrimage. View of approach route to Monaincha Abbey and pilgrim site. Yes, indeed, there is an island of the living in the heart of Ireland a little more than three kms east of the town of Roscrea on the provincial borders between Munster and Leinster. This now drained Holy Island (in fact there were two islands as Giraldus Cambrensis attested in the 12th century) sits surrounded by cutaway bog. Its noble ruins consist of a beautiful 12th century Hiberno-Romanesque nave and chancel church with a later transept, and a twelfth century high cross placed on an earlier base. Romanesque Doorway of the surviving church at Monaincha. The cross was re-erected in the late 1940s (using a cement shaft!) and features the crucified Christ in a long robe in the style of pilgrim crosses from Lucca in Italy. Similar features may be seen at nearby Roscrea and at Cashel. High Cross at Monaincha depicting the crucified Christ in a long robe in the style of pilgrim crosses from Lucca in Italy. The island was the retreat of neighbouring saints, Canice of Aghaboe and Cronan of Roscrea, both of whom used the place as a sanctuary of personal peace. 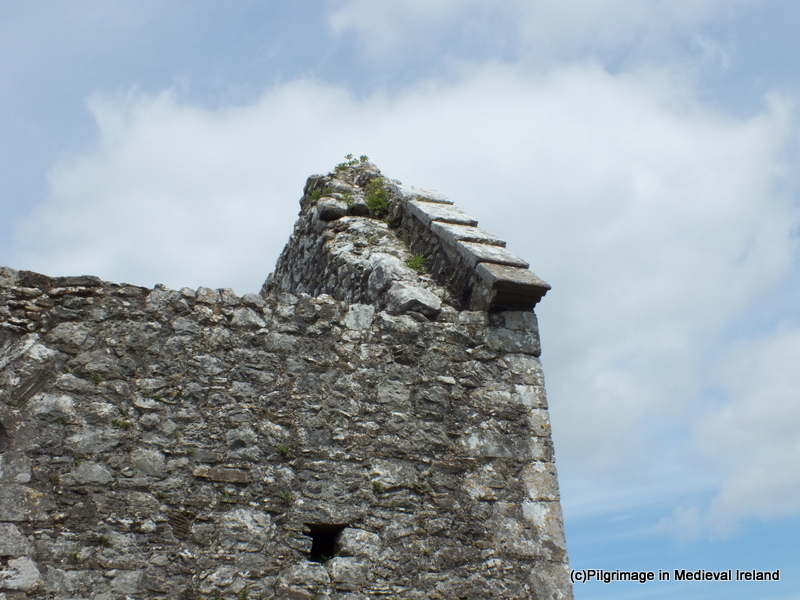 It became a main centre for the Céli Dé and pilgrims were attracted to it from all over Ireland and from abroad. The Augustinian Canons continued the pilgrimage tradition in the 12th century and the prior of the Island – usually an O Meachair from the ruling clan of the area – figures prominently in the Papal letters during medieval times. A huge revival of pilgrimage at the beginning of the 17th century saw thousands flock to the site to do the ‘rounds’. A diary of a German pilgrim Ludolf von Munchhausen, who travelled from northern Germany, as a curious tourist rather than as a pilgrim, in Spring 1590/91, has been recently translated. The martyred bishop of Down and Conor, Conor O’Devany was here shortly before he was executed. Monaincha received the same plenary indulgences remission as famous continental sites such as Santiago de Compostella. View of Monaincha on a frosty day. Derrynaflan is best known for its medieval metal work, including a two-handled chalice known as the Derrynaflan chalice, on display in the National Museum of Ireland. 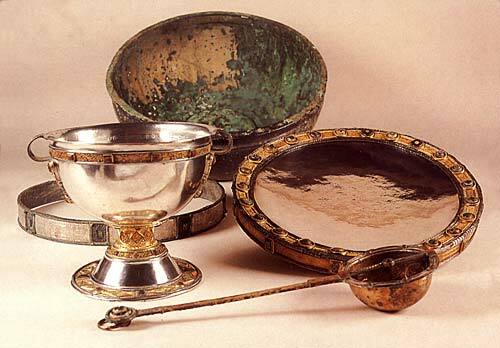 The chalice along with a paten, a liturgical strainer and basin were part of a hoard of treasure found by metal detectorist on land close to the monastery of Derrynaflan Co Tipperary. The complications, surrounding their discovery, helped to instigate Ireland’s current metal detecting laws which make it illegal for anyone to engage in metal detecting without a licence. As a child I remember going on a school trip to the National Museum at Kildare St. After all these years I still remember this visit clearly, along with our teacher pointing out this treasure (Derrynaflan Chalice) found in my home county. I also purchased a small booklet in the museum shop on the chalice which I still have, once a nerd always a nerd. The craftsmanship of the chalice and other objects is true breathtaking. 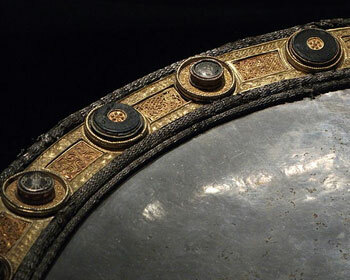 Decoration on the Derrynaflan paten (a plate used to hold the host during the celebration of the Eucharist). The hoard is associated with the monastery of Derrynflan. The monastery sits on an island in Littleton raised bog, in the townland of Lurgoe, approx 11km from the modern town of Thurles in Co Tipperary. Aerial shot of Derrynaflan (from the Slieveardagh Rural Development http://www.slieveardagh.com/history/towns-and-villages/derrynaflan/). In early medieval times it was located close to the territorial boundary of the territories of the Éile and the Éoghanact. As you can see from the photo above much of the surrounding bog has been processed and removed by Board na Mona, giving the land a desolate and unappealing vista. One can only imagine what his site and its surrounding landscape would have looked like in medieval times. 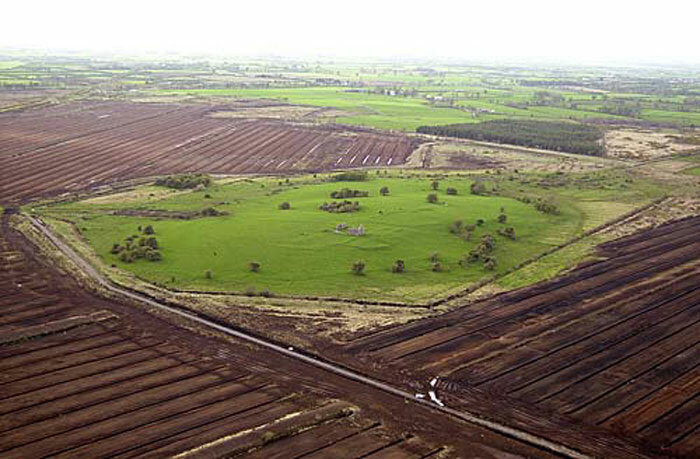 Although built-in the middle of a bog, Derrynaflan was far from isolated and recent archaeological excavations in the surrounding bogland, has revealed the presence of several bog roads and trackways, some of which line up with the site. These roads and tracks linked the monastery to the wider world. The Irish and Latin Lives of St Ruadhán recounts an interesting tale concerning one of these roads. St Colmán Mac Dáirne of the monastery of Daire Mór decided to bring a gift of butter to St Ruadhán who at the time was residing at Derrynaflan. 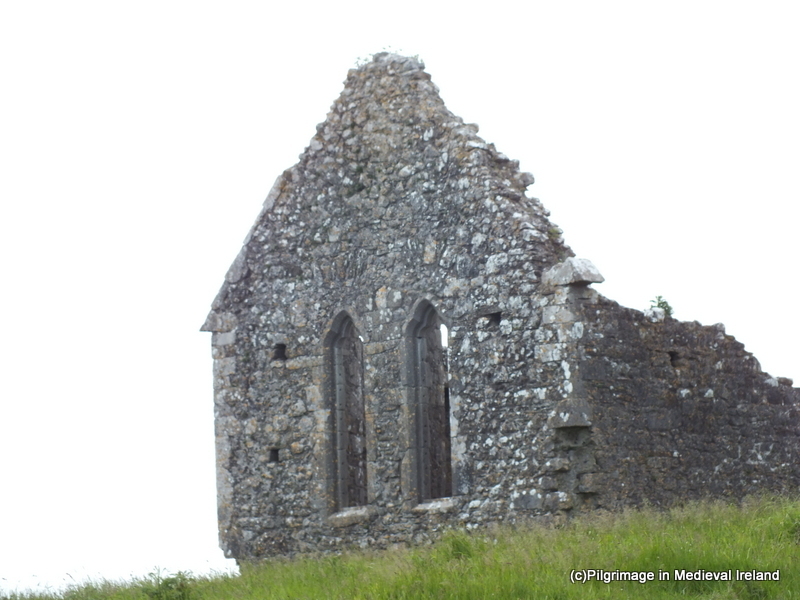 Conn Manning (1997) has identified the monastery of Daire Mór as Longfordpass alias Durrihy, located north of Thurlas. Colmán placed the butter in a vessel which was carried by two oxen and set off on his journey. We are told that he two monasteries were divided by bog but Our Lord miraculously made a road spring up through the bog so that Colmán could deliver the butter. Derrynaflan was founded by St Ruadhán of Lorrha in the 6th century (Harbison 1970, 226) but the site gets its name from two other saints who lived here during the 9th century. In Irish Derrynaflan is Doire na bhFlann, in English the name means ‘the wood of the two Flanns’. This placename remembers two saints both called Flann (meaning red or blood-red) who are associated with the site. The saints were Flann son of Foircheallach and Flann son of Dubh Tuinne (Conna), both acted as co patrons of the area. The calendars of Irish saints note Flann Foircheallach died in 825 and his feast was commemorated in the 21st of December. 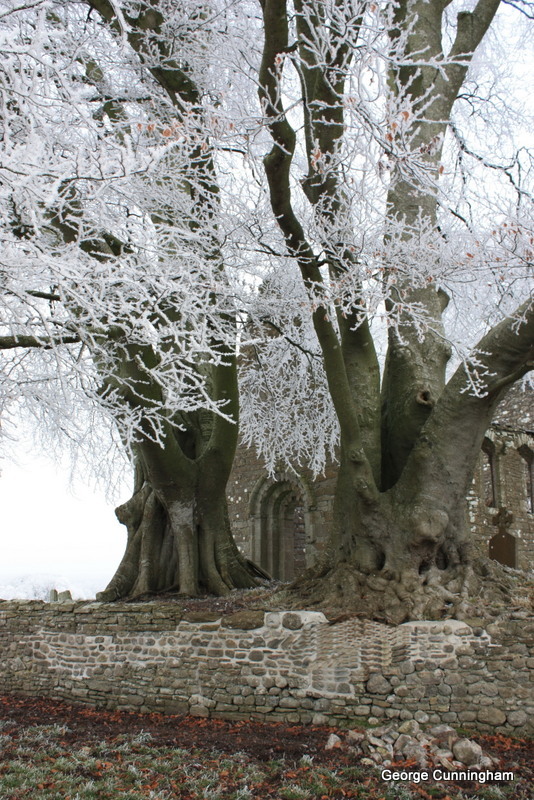 The monastery acquired its present name by the association with two prominent clerics of the early 9th century, Fland mac Duib Thuinne of Dairinis who died in 821 and Fland mac Fairchellaig, abbot of Lismore who died in 825 (ibid.). Derrynaflan was linked to the Ceilí Dé movement and the annals suggest links to other Céili Dé churches at Lismore, Emly and Cork. Additionally it is included in a list of sites in ‘union’ with Máel Ruain, and the asceticism practices by Flann son of Dubh Tuinne is elsewhere specified in the rule attributed to Máel Ruain who was the patron of Tallaght (Ó’Riain 2011, 345). The approach to the Derrynaflan is little bit difficult but so worth the effort. I visited here during the summer with Conor Ryan of the South Tipperary Development Company who is currently working in a project to develop an The Derrynaflan trail linking this site and other church sites such as Holy Cross Abbey in east Tipperary Slieveardagh area. We approached the site from the north the townland of Liskeveen and followed a small surfaced bog road and then headed cross county through some scrub. It is also possible to approach the site from the south. After a little bit of walking we came to the base of a hill and were rewarded with view of the ruins of the monastery sitting on top of a hill. The monastic site consists of a series of earth work and the ruins of a church and a single wall of another monastic building. The island was originally enclosed by a bank and outer fosse (ditch) which is visible only in places and the eastern side of the enclosing bank and fosse are now covered by a build up of bog and peat (Ryan 1980, 10). Today the most visible remains are the church. This is a nave and chancel church with two phases of construction. The nave of the church appears to be pre-Norman, a separate church in its own right. In the 13th century the chancel was added on this earlier church then became the nave of the new building. Only the walls of the chancel in the north, south and east survive to any great height . The earlier church (nave) was built of coursed Cyclopean limestone masonry (large blocks), of which only the lower courses of the south wall survive (Ryan 1980, 11). The east gable contains two single-light trefoil-headed windows, while there are three single-light trefoil-headed windows in the south wall. At the east end of the south wall there is a re-used Romanesque window which was used to frame a decorated sandstone piscina. Within the interior of the church there is a triangular-shaped gable finial with socket for a cross belonging to the original roof of the 13th-century church. Along the top of the north side of the east gable are stone roof slates, additional stone roof slates from the medieval chancel were also found during previous excavations (Ó Floinn 1985, 37). Derrynaflan is also associated with a mythical figure called the Gobán Saor. The Gobán was a highly skilled smith or architect in Irish history and legend. Tradition holds he was responsible for building many of Ireland’s castles and churches including Holy Cross Abbey. 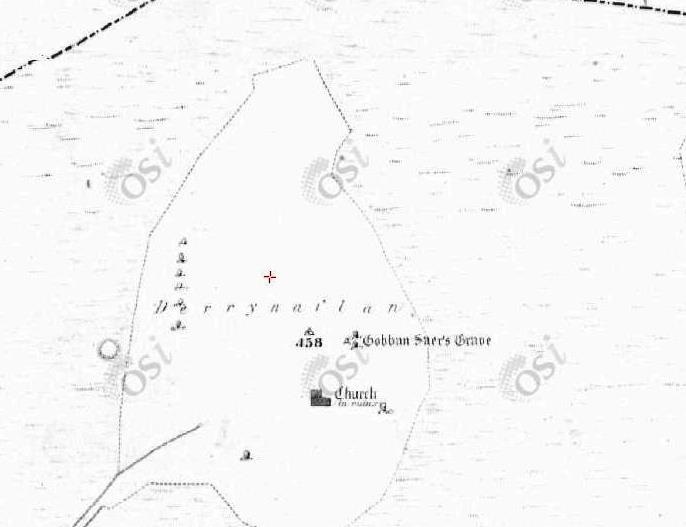 Local tradition holds that the Gobán Soar was buried at Derrynaflan and the 1st edition Ordnance Survey map marks the site of his grave to the north-east of the church. ‘further down the slope to the north, are the graves of the Gobann and his wife and two children. Stones of coffin shape mark the place and bear quaint figures and curious celtic tracery. Heretofore, these relics were religiously preserved, but latterly they have suffered in some ways. A barabarian smashed one of the stones some years ago and obliterated the tracves with a chisel’. Traditionally the Gobaun was said to have been Grand Master of the ancient order of Freemasons in Ireland (ibid). Today the area is an area defined by a timber fence. 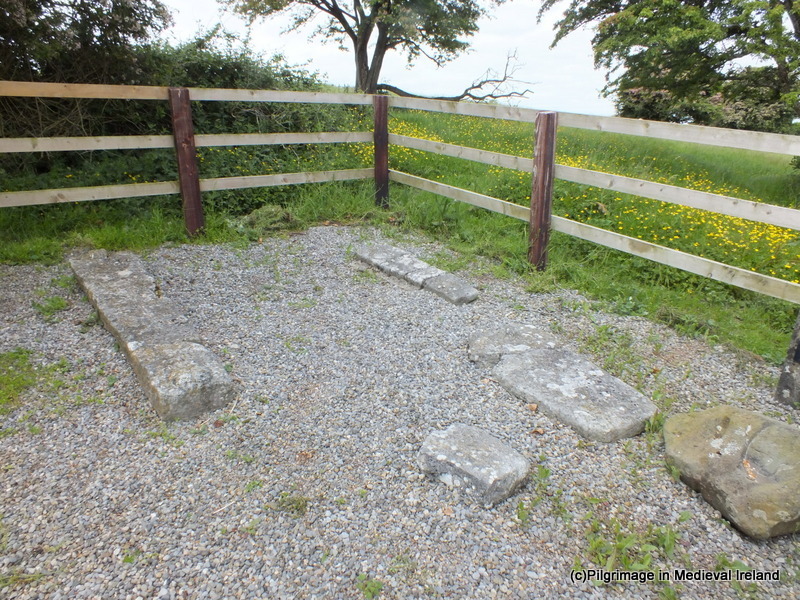 Inside the fence are three very worn medieval grave slabs one which is held to mark the Gobán’s grave. I will come back to the Gobán again in the new year as I think this very interesting character is deserving of his own blog post. This quiet site is transformed into an annual place of pilgrimage at Easter time when there is a celebration of a dawn mass on Easter Sunday. The tradition was started by Canon Liam Ryan, PP, Killenaule-Moyglass, in the 1990s and attracts large numbers of pilgrims from the surrounding areas. I am hoping to attend this pilgrimage in 2014. My friends at Abarta Heritage have a great a audio guide for this and some of the other sites in the area . Byrne, F. J. 1980 Derrynavlan: the historical context. In JRSAI 110, 116-26. Ó Floinn, R. 1987 ‘Derrynaflan’, Lurgoe: Monastic settlement. In I. Bennett (ed. ), Excavations 1986: summary accounts of archaeological excavations in Ireland, 33. Bray. Wordwell. Ó Floinn, R. 1988 ‘Derrynaflan’, Lurgoe: Monastic settlement. In I. Bennett (ed. ), Excavations 1987: summary accounts of archaeological excavations in Ireland, 24-5. Bray. Wordwell. Manning, C. 1997. ‘Daire Mór identified’ Peritia 11, 359-69. Ryan, M. 1980 An Early Christian hoard from Derrynaflan, Co. Tipperary. NMAJ 22, 9-26.